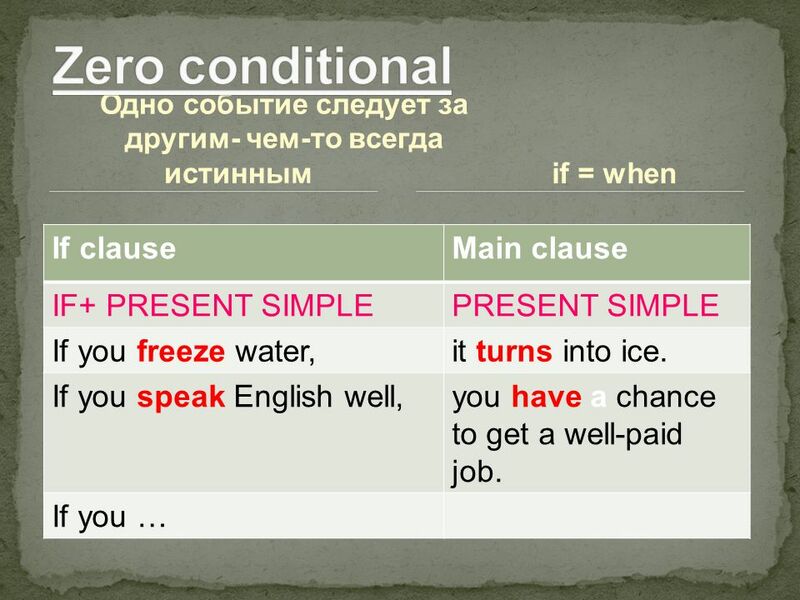 Одно событие следует за другим- чем-то всегда истинным If clauseMain clause IF+ PRESENT SIMPLEPRESENT SIMPLE If you freeze water,it turns into ice. 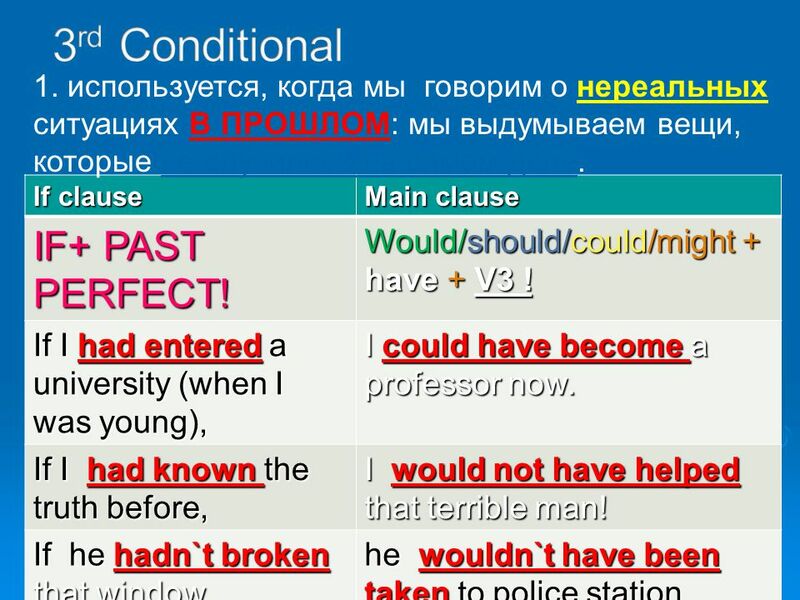 7  Иногда в Zero и 1 st conditional используется Unless + present simple когда мы говорим о событиях, которые могут случиться, если только кто-то этому не помешает. 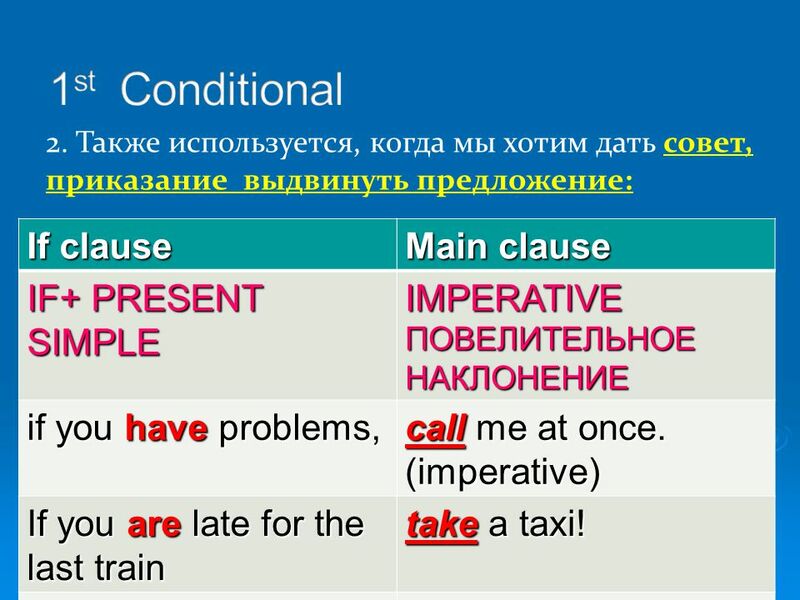 Main clause Unless+ present simple She always comes to work, unless she is seriously ill. We are always ready to help, unless it is not too late. 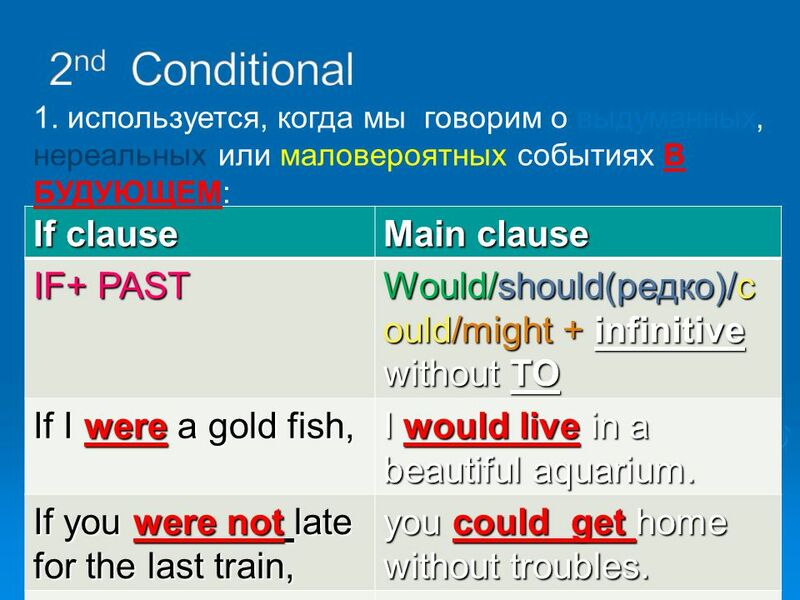 10 If clause Main clause IF+ PAST PERFECT! Would/should/could/might + have + V3 ! If I had entered a university (when I was young), I could have become a professor now. If I had known the truth before, I would not have helped that terrible man! If he hadn`t broken that window, he wouldn`t have been taken to police station, wouldn`t have been late for work and would `t have been fired. 1. используется, когда мы говорим о нереальных ситуациях В ПРОШЛОМ: мы выдумываем вещи, которые не случились на самом деле. 12 1. If you (to love) nature you never ( to throw) litter outdoors. 2. If I (to get up) late I usually (to have) a headache. 3. If you (not to eat) long you (to get) weak. 4. 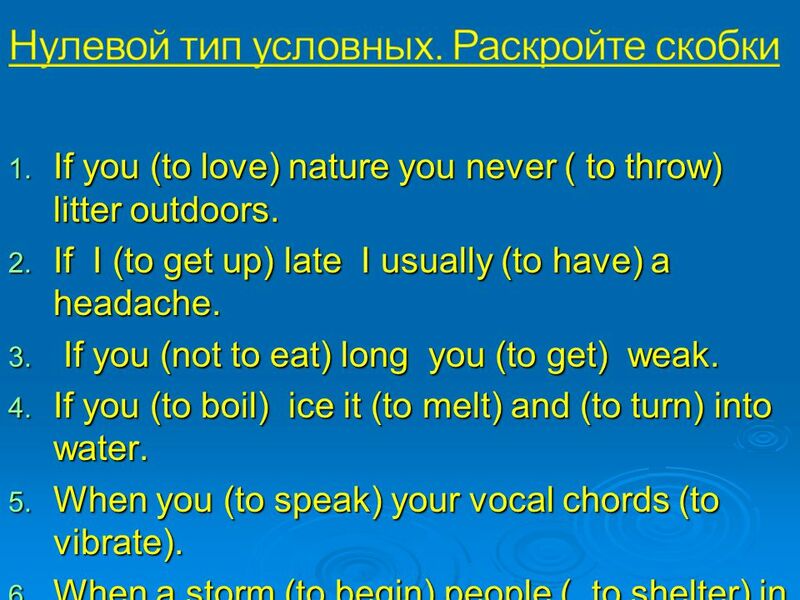 If you (to boil) ice it (to melt) and (to turn) into water. 5. When you (to speak) your vocal chords (to vibrate). 6. When a storm (to begin) people ( to shelter) in their homes. 13 1. If we (to walk) to the park we (to feed) some birds there. 2. 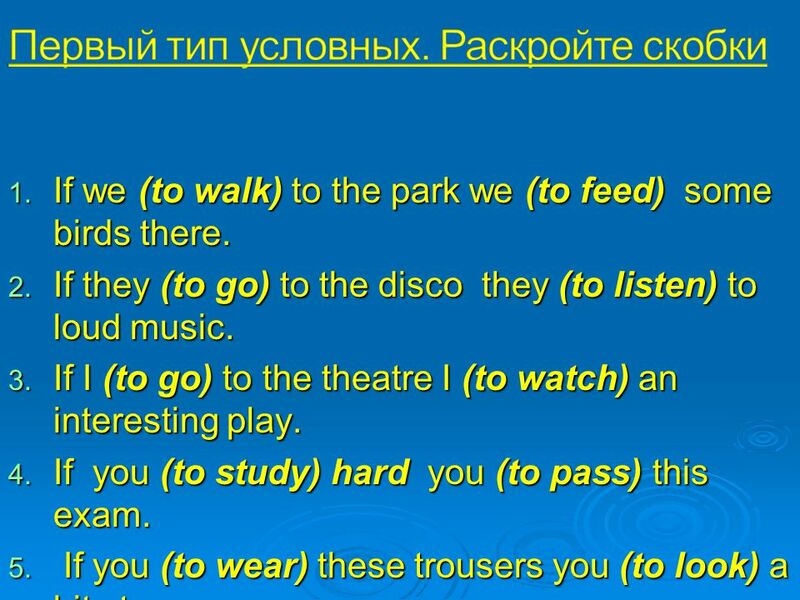 If they (to go) to the disco they (to listen) to loud music. 3. If I (to go) to the theatre I (to watch) an interesting play. 4. If you (to study) hard you (to pass) this exam. 5. If you (to wear) these trousers you (to look) a bit strange. 6. If you (to play) this composition your guests (be pleased). 7. If David (to forget) his umbrella I (to give) him mine. 8. If the sun (to shine) all day we (to go) to the beach. 9. If he (to have) a temperature he (to see) the doctor. 14 1. If I (to see) Mary, I would (to be) really glad to meet her. 2. If Rachael (to be) rich, she (to study) at a foreign college. 3. If it (to snow) now, it (to be) really difficult to get to the country for us. 4. surprised? 5. If somebody (to rob) your house, what (to do) you? 6. If I ever (to get) married, I (to do) it only of love. 7. If I (to have) enough money, I (buy) a country cottage. 15 1. 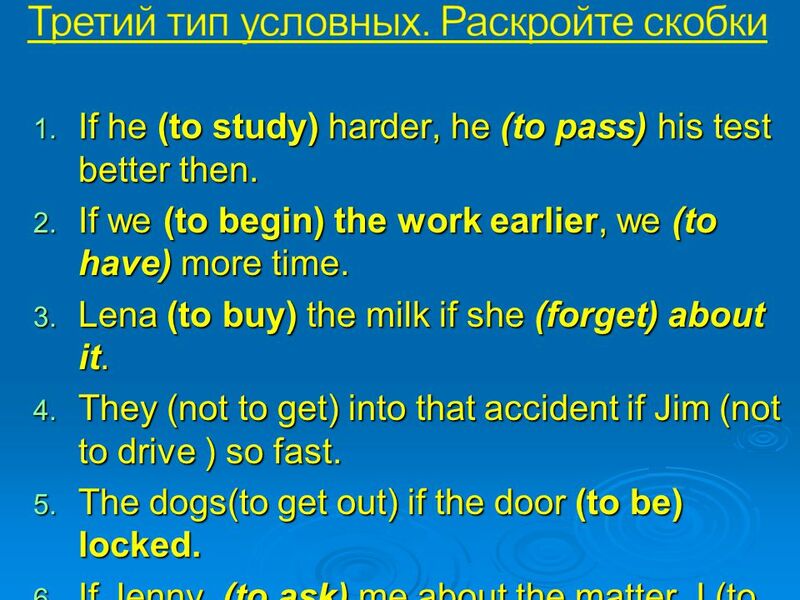 If he (to study) harder, he (to pass) his test better then. 2. If we (to begin) the work earlier, we (to have) more time. 3. Lena (to buy) the milk if she (forget) about it. 4. They (not to get) into that accident if Jim (not to drive ) so fast. 5. The dogs(to get out) if the door (to be) locked. 6. If Jenny (to ask) me about the matter I (to answer) all her questions. 7. I (to call) the police if I (to see) those robbers again. 16  If I were you I would tell him about their plan.  If he had come yesterday we would have met him.  If this story were not interesting I wouldn`t read it!  If we had come a minute later, we would not have seen the matter.  If it rains hard for a long time water runs along the streets.  If I have some free time I will call on you. 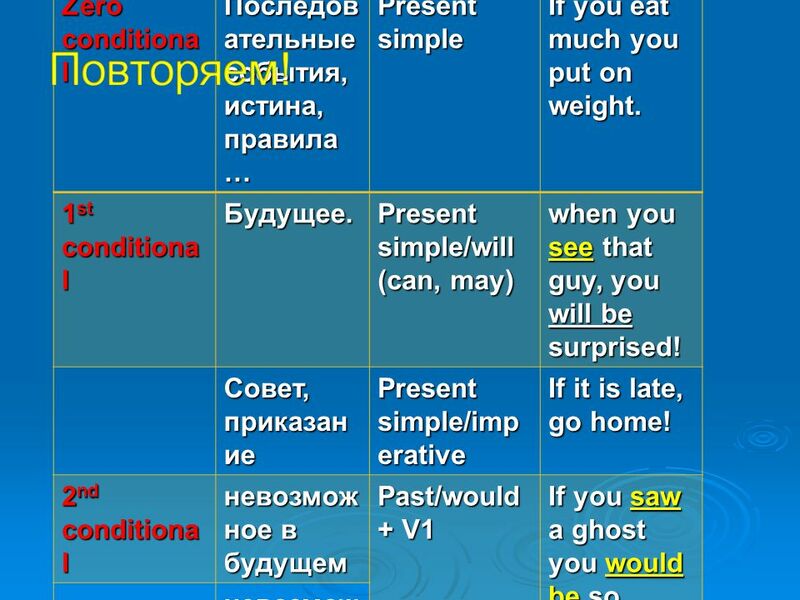 Download ppt "Одно событие следует за другим- чем-то всегда истинным If clauseMain clause IF+ PRESENT SIMPLEPRESENT SIMPLE If you freeze water,it turns into ice." Unit 2 No one knew who I was. 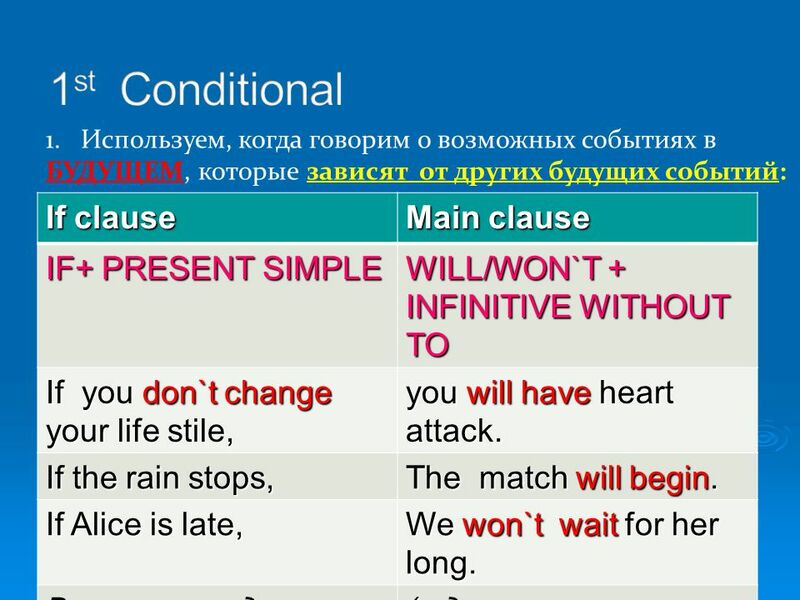 Past Simple and Past Continuous. 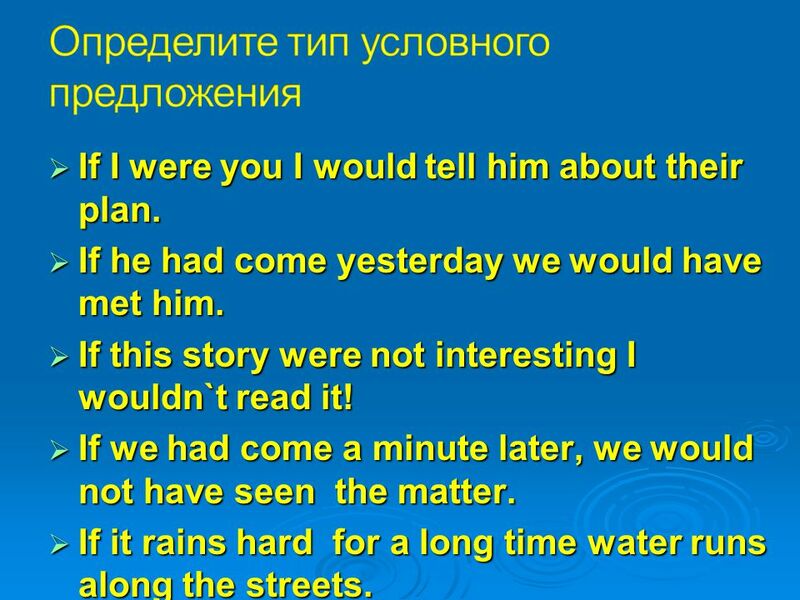 Put these sentences into the right order. I wasnt listening to the teacher. She was texting someone when I saw her. Yesterday. Unit 2 What should I do? (period one). 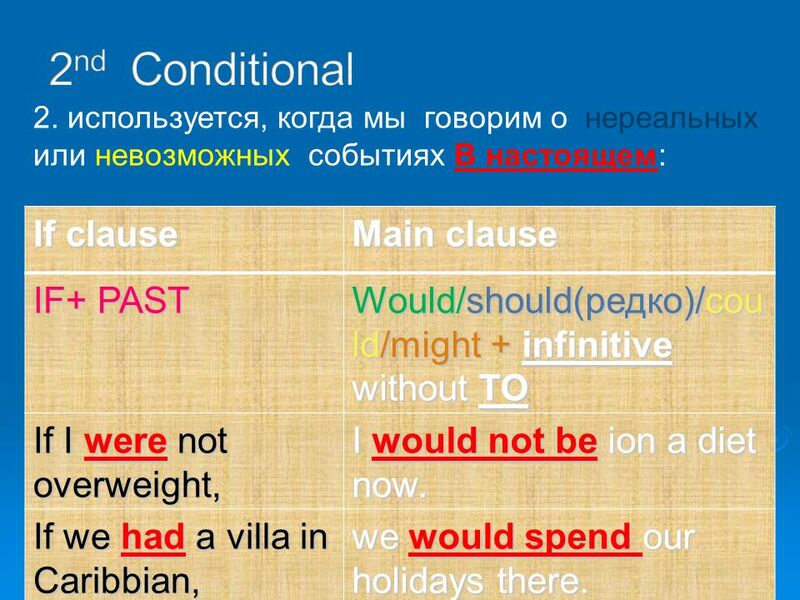 Workshop 2: Grammar Unit Future Life Conditional Sentences. 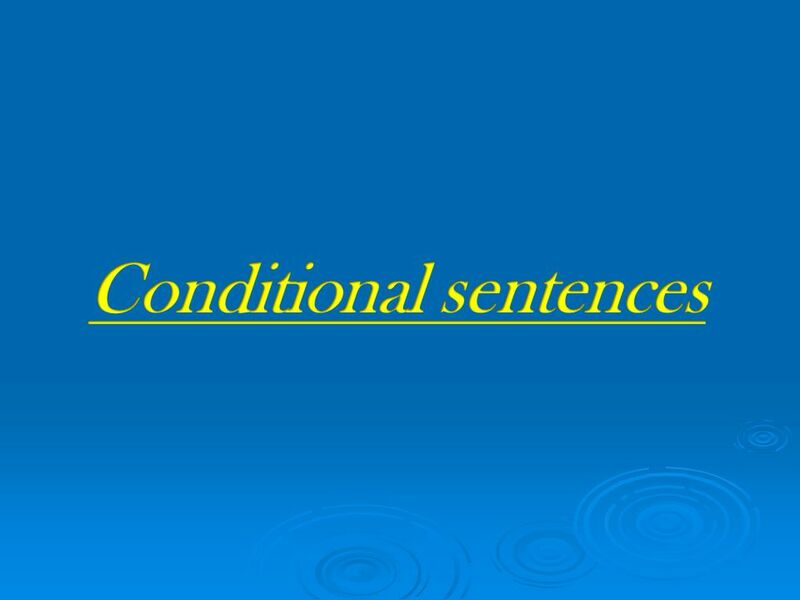 Conditional Sentences (General conditionals – facts) Think about what happens in the following conditions. If you throw wood into water, … If you wash.
Noun Clauses Mustafa Güneş. 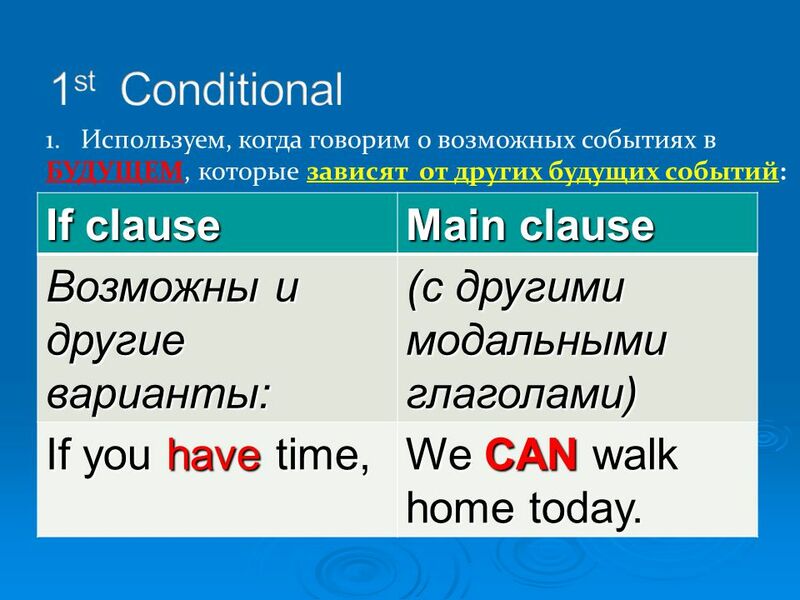 What do you think a noun clause is? What will the president do? Can you tell me what the president will do? I don’t know the. O.Henry ( Money Talks) تقديم الطالب : مسعود سليمان الصف العاشر ثانوية تشرين – القامشلي Email : mytarget60@yahoo.com Number 24 Park Street is a big, expensive.